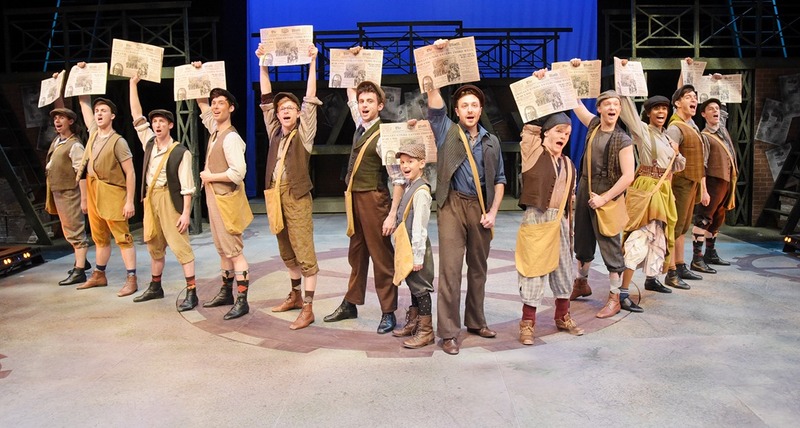 The newsboys in the cast of Disney’s “Newsies” playing at the Westchester Broadway Theatre in Elmsford thru May 26. See “Theater” for details. WESTCHESTER COMMUNITY COLLEGE CELEBRITY SALON SERIES. Various private homes. Events raise funds for student scholarships. May 3: Host Yvonne Pollack’s Marcel Breuer-designed home will be the perfect coda to viewing the Edward Larrabee Barnes-architected Katonah Museum of Art. 6:30 p.m. Join Katonah Museum of Art Executive Director Michael Gitlitz and curator Michele Wijegoonaratna for a private tour of “LandEscape: New Visions of the Landscape from the Early 20th and 21st Centuries” at the museum. May 5: Joanne Landau and Fred Schwalb’s Croton-Hudson home. 11:30 a.m. Anna Quindlen will talk about becoming a grandmother. She illuminates the special joy of grandparenting. Cocktails and hors d’oeuvres will be served at all salons. $165 per event. Additional events will be listed in upcoming issues. www.sunywcc.edu/celebritysalons; 914/606-6558. LUCY’S LAUGH LOUNGE. 446 Bedford Rd., Pleasantville. Apr. 12: Friday Night Showcase. 7:30 p.m. Osei Caleb, James Murphy, Joe Cuomo and more. Apr. 13: Fred Rubino at 6 & 8 p.m. $30. Admission is for ages 16 & over only or 13 & over with a parent. Apr. 20: Rich Vos at 6 & 8 p.m. He is an American comedian and actor. $20 online; $25 at the door. www.lucyslaughlounge.com; 914/200-4812. JAZZ FORUM ARTS. 1 Dixon La., Tarrytown. Apr. 12 & 13: Bob James Trio celebrates “Expresso CD. 7 & 9:30 p.m. $30 & $35. Apr. 14: John Marshall Quintet at 4 & 6 p.m. $15 & $20. Apr. 19 & 20: Alexis Cole Trio featuring David Finck and Kenny Hassler. 7 & 9:30 p.m. $20-$25. www.jazzforumarts.org; 914/631-1000. MONROE CROSSING. Emelin Theatre, 153 Library La., Mamaroneck. 8 p.m. Bluegrass music. $42 & $35. 914/698-0098; www.emelin.org. NICK LOWE’S QUALITY ROCK & ROLL REVUE STARRING LOS STRAITJACKETS. Tarrytown Music Hall, 13 Main St., Tarrytown. 8 p.m. Special guest: Dawn Landes. $38, $48 & $60. www.tarrytownmusichall.org. SMART ARTS PERFORMANCE ACADEMY. Academic Arts Building, Westchester Community College, 75 Grasslands Rd., Valhalla. 1 p.m. A new initiative showcasing aspiring and talented Westchester County student performers (pre-college and college). Enjoy an afternoon of music with an opportunity to meet and greet Westchester’s young creatives. Free and open to the public on a first come, first served basis. 914/606-6262. THE SIXTIES SHOW™. Emelin Theatre, 153 Library La., Mamaroneck. 8 p.m. The greatest 1960s musical recreation show on earth featuring former members of Bob Dylan’s bands, Dave Davies’ band, James Brown’s Bands and NBC TV Saturday Night Live Band. $45, $38 & $30. 914/698-0098; www.emelin.org. DAVID BROMBERG QUINTET. Irvington Town Hall Theater, 85 Main St., Irvington. 8 p.m. With special guest Leslie Mendelson. Presented by Common Ground Concerts. $45. www.commongroundconcerts.com. TUSK: THE WORLD’S #1 FLEETWOOD MAC TRIBUTE. Tarrytown Music Hall, 13 Main St., Tarrytown. 8 p.m. Tusk covers all the great hits of Fleetwood Mac. $26, $32 & $36. www.tarrytownmusichall.org. DIMMER TWINS: PATTERSON HOOD & MIKE COOLEY OF DRIVE-BY TRUCKERS. Tarrytown Music Hall, 13 Main St., Tarrytown. 8 p.m. This stripped-down duo features original solo and duo material penned by both Hood and Cooley, and also some Drive-By Truckers songs that they’ve written. $30, $35 & $40. www.tarrytownmusichall.org. DUELING PIANO ENTERTAINMENT WITH SAVAGE PIANOS. Blue Moon Mexican Café, 7-27 Pondfield Rd., #27, Bronxville. 8:30 p.m. Free. Two players, two pianos in this unique performance of the finest caliber in dueling pianos. 914/337-4000. SHEEP-TO-SHAWL FESTIVAL. Philipsburg Manor, 381 N. Broadway, Sleepy Hollow. 10 a.m.-5 p.m. Festival celebrates all things wooly sheep. Visitors are invited to explore each step in the process of turning wool into cloth using 18th-century techniques. Hands-on activities include dyeing wool and crafts for children, including a giant 20’ diameter weaving project. Outside on the grounds, Scottish border collies display their skills at sheep and duck-herding. There will also be a fashion show, Project Colonial Runway and kick up their heels to the sounds of a live bluegrass band. $16; $12 seniors and students 18-25; $8 ages 3-17 and free for children under age 3. 914/366-6900. PERFORMING FAMILIES: AN EVENING OF MUSIC, DANCE AND CONVERSATION. ArtsWestchester, 31 Mamaroneck Ave., White Plains. 7-9 p.m. Celebrate the bonds of music and dance with four family ensembles as they perform and discuss the meaning of kinship, tradition and the arts. The event features indigenous Aztec dancers Grupo Ati-Tiachinolli, Benin family band Jomion and the Ulkos, South Indian classical dancer Nalini Rau and her Natya Anubhava Academy and mother-daughter Korean music-dance trio Heejung, Zena and Jaylyn Han. $10; free for children under 10. 914/428-4220. WEDNESDAY DANCE WITH BALLET DES AMÉRIQUES. Tarrytown Music Hall, 13 Main St., Tarrytown. 7 p.m. French-American choreographer Carole Alexis and her Port Chester-based Ballet des Amériques dance company bring a rich and sprawling repertoire to the Tarrytown Music Hall in a new series called Westchester Wednesday Dance. These weekday evenings of dance offer audiences a break in the workday routine and a chance to witness the original work of the Music Hall’s company in residence. Treat yourself to a Wednesday night of vibrant culture! $20 & $35. www.tarrytownmusichall.org. WESTCHESTER JEWISH FILM FESTIVAL 2019. Jacob Burns Film Center, 364 Manville Rd., Pleasantville. Festival features 42 entertaining, thought-provoking and engaging films, a robust mix of narratives, documentaries and some of Israel’s fantastic TV programming too. Festival centerpiece is There will also be a celebration of Carl Reiner with films Apr. 14 & 17. For a complete list of films go to www.burnfilmcenter.org. “BRESLIN AND HAMILL: DEADLINE ARTISTS. Purchase College, 735 Anderson Hill Rd., Purchase. 4 p.m. HBO documentary directed and produced by Jonathan Alter, John Block and Steve McCarthy. Screening and Q&A with the directors. Film explores the famed writers’ intersecting lives and careers while celebrating New York’s grit and charm during the last great era of print journalism. Free and open to the public. 914/251-6550. FOCUS ON NATURE 2019. Jacob Burns Film Center, 364 Manville Rd., Pleasantville. A rich selection of thought-provoking and moving nonfiction films about the beauty, power, and mystery of nature, and some of the people working to protect it. Apr. 18: “The Biggest Little Farm.” 7 p.m. Q&A with Stone Barns Director Jack Algiere with reception. $20 for non-members. Apr. 18-25: Various times. Chronicling eight years of daunting farm work and outsized idealism, the film is a testament to the immense complexity of nature and an inspirational story about a young couple who leave their tiny LA apartment and move onto 200 acres in the foothills of Ventura County to build one of the most diverse farms of its kind. Apr. 20: 4 p.m. Q&Q with filmmakers Susan Todd and Andy Young. $20 for non-members; $10 for children/students. Apr. 20: “Grand Cru.” 7:15 p.m. Q&A winemaker Pascal Marchand with reception. In 1983 Marchand, a 21-year-old aspiring poet from Montreal, arrived in the mythical land of Burgundy to work the harvest. Immediately enchanted, he settled there and embarked on an unlikely path to winemaking stardom. Three decades later, he is renowned as an artist and innovator, finding his inspiration in the techniques of the medieval Cistercian monks who meticulously studied and refined Burgundy’s winemaking. Captured over the catastrophic 2016 season, which saw devastating frosts, hailstorms, and disease in the vineyards, Grand Cru is both a love letter and a cautionary tale, as winemakers like Pascal face the unpredictable and destructive consequences of climate change. $30 for non-members. Additional films will be listed in upcoming issues. www.burnsfilmcenter.org. GREAT BOOKS FORUM. Gateway Center, Westchester Community College, 75 Grasslands Rd., Valhalla. 6-8 p.m. Free and open to the public. Theme: Imperial Narratives. Junot Diaz’s “Drown.” No reservations necessary. ww.sunywcc.edu. RENAISSANCE ARTISTS: AMEDEO MODIGLIANI AND SANDRO BOTTICELLI. Westchester Italian Cultural Center, 1 Generoso Pope Pl., Tuckahoe. 7-9 p.m. Presented by John Coppola. $25. Register at www.wiccny.org. AUTHOR VICTORIA JOHNSON. Jay Heritage Center, 210 Boston Post Rd., Rye. 6-8:30 p.m. Lecture and spring cocktail reception. Her book “American Eden” tells the untold story of Alexander Hamilton and Aaron Burr’s personal physician, whose dream to build America’s first botanical garden inspired the young Republic. Book signing will follow. $25. www.jayheritagecenter.org; 914/698-9275. NICHOLAS POWERS. Gateway Building, Westchester Community College, 75 Grasslands Rd., Valhalla. 9:30-10:45 a.m. Free. The poet, journalist, activist and professor will read from his works—his books include “The Ground Below Zero” and “Theater of War.” He also co-hosts the NYC College Poetry Slam at the Nuyorican Café. 914/606-6716. “FAME THE MUSICAL.” Grinton I. Will Library, 1500 Central Park Ave., Yonkers. Apr. 12 at 7 p.m., Apr. 13 at 2 & 7:30 p.m. and Apr. 14 at 3 p.m. The pop culture phenomenon about the legendary NY High School of the Performing Arts lives forever. $20 students/seniors; $25 regular admission in advance. At the door (cash or check only) $23 students/seniors; $28 regular admission. Brownpapertickets.com/event/4096285. “WORKING.” Veterans Memorial Building, 210 Halstead Ave., Harrison. Fri. at 8 pm., Sat. at 2 & 8 p.m. & Sun. at 2 p.m. Presented by Harrison Players, Inc. www.harrisonplayers.org. DISNEY’S “NEWSIES.” Westchester Broadway Theatre, 1 Broadway Plaza, Elmsford. Wed., Thurs. and some Fri. matinees: lunch at 11:30 a.m.; show at 1 p.m.; Thurs.-Sat. dinner at 6:30 p.m., show at 8 p.m.; Sun. matinee lunch at 12 p.m., show at 1:30 p.m. and dinner at 5:30 p.m., show at 7 p.m. Musical is based on the 1991 Disney movie about the real-life Newsboy Strike of 1899, it is the rousing tale of Jack Kelly, a charismatic newsboy and leader of a ragged band of teenaged “newsies” who dream only of a better life far from the hardship of the streets. $59-$89 plus tax, depending on the performance chosen. Beverage service & gratuities are not included in the ticket price. www.broadwaytheatre.com; 914/592-2268. “PROOF.” Whippoorwill Hall Theatre, North Castle Library, Kent Place, Armonk. Fri. & Sat. at 8 p.m.; Sat., Apr. 13 at 3 p.m. Presented by the Hudson Stage Company. Proof is the intriguing story of an enigmatic young woman, her manipulative sister, their brilliant father and an unexpected suitor. They are all pieces of the puzzle in the search for the truth behind a mysterious mathematical proof. $40; $35 for students and seniors. www.hudsonstage.com. “A GENTLEMAN’S GUIDE TO LOVE AND MURDER.” Kweskin Theatre, Curtain Call, Inc., 1349 Newfield Ave., Stamford. Fri. & Sat. at 8 p.m., Sun. at 2 p.m.; (no performance Easter Sunday, Apr. 21) and Thurs. Apr. 18 & 25 at 8 p.m. A little bit murder mystery, a little bit love story and a lot of laughs, this musical is the story of Monty Navarro, an heir to a family fortune who sets out to jump the line of succession by eliminating the eight pesky relatives who stand in his way. $35 for adults; $25 senior citizens and 17.50 for children. Thrifty Thursday tickets are $27.50. 203/461-6358 x36 or www.curtain callinc.com. IN THE MOOD: 1940S MUSICAL REVUE. Tarrytown Music Hall, 13 Main St., Tarrytown. 7:30 p.m. Presented by Turnaround Artists. Performed by a 13-piece big band and six singer-dancers with some hot boogie-woogie! In The Mood is a fully staged tribute to Glenn Miller, Tommy Dorsey, The Andrews Sisters and big band greats of the '40s, complete with period costumes and choreography. $33, $43 & $53. www.tarrytownmusichall.org. THE TRIPLETS OF BELLEVILLE. PepsiCo Theatre, Purchase College, 735 Anderson Hill Rd., Purchase. 8 p.m. A fantastical caper involving the Tour de France, the French Mafia, a kidnapping and a wily grandmother and her faithful dog. Wild spectacle features dancing, singing, foley sound effects and an original hot swing score performed live by its composer, Benoit Charest and his 8-piece orchestra Terrible de Belleville band. Recommended for ages 10 & older. $40, $30 & $20; kids 16 & under: $21.25, $16.25 & $11.25. www.artscenter.org. BURIED TREASURES OF THE SILK ROAD. Bruce Museum, 1 Museum Dr., Greenwich. Thru June 2. Showcases the collection of Chinese tomb sculpture in the Fred and Jane Brooks Collection at the museum. Features dozens of rare and delicate terra cotta figurines, painted and glazed ceramics and other antiquities. Apr. 18: 6-8 p.m. David Ake Sensabaugh will present “Providing for the Afterlife in Han Dynasty China.” Museum hours: Tues.-Sat., 10 a.m.-5 p.m. $10 adults; $8 seniors and students with ID; free for members and children under 5. Individual admission is free on Tuesdays. 203/869-0376; www.brucemuseum.org. HILDRETH MEIÈRE: THE ART OF COMMERCE. Fairfield University Art Museum, 1073 N. Benson Rd., Fairfield, Ct. Thurs., Apr. 18-Sept. 21. Meière was a prolific naturalist who discovered the frescoes and mosaics in Florence, Italy that were to inform her craft. There will be an opening night lecture Wed., Apr. 17 by Joseph A. LoSchiavo followed by a reception with live music by the Survivors Swing Band that is free and open to all. June 15: Anne Kupik, the great-granddaughter of Meière, will talk about her career, followed by a wine and cheese reception. www.fairfield.edu/museum. HIGH SCHOOL ART SALON. Pelham Art Center, 155 Fifth Ave., Pelham. Thru Apr. 19. Features exceptional art in a range of media—sculpture, collage, painting, drawing and mixed media by students in advanced art classes from Bronxville High School, Dobbs Ferry High School, Fordham Preparatory School, Mamaroneck High School, New Rochelle High School, Pelham Memorial High School and Scarsdale High School. Free event Apr. 12: Teen Open Mic Night, 7-10 p.m. 914/738-2525. FIBER NOW. Rye Arts Center, 51 Milton Rd., Rye. Thru Apr. 27. Artists from a wide range of backgrounds gather together to exhibit works that feature a common “thread”—fiber. www.ryeartscenter.org. POTS FOR PETS. Clay Art Center, 40 Beech St., Port Chester. Thru June 1. Celebrating pottery for the “furry members” of our family with handmade dog and cat bowls. 10% of all gallery sales will go to Adopt-a-Dog, a Greenwich, CT nonprofit organization with a shelter in Armonk. www.clayartcenter.org. SHARKS! Bruce Museum, 1 Museum Dr., Greenwich. Sat., Apr. 20-Sept. 1. Visitors to this interactive science exhibition will get up close and personal with life-sized models of a great white, hammerhead and some of their living and extinct cousins. Watch live sharks developing within eggs and compare and contrast jaws from nearly 20 different species. Exhibit will also address climate change. Museum hours: Tues.-Sat., 10 a.m.-5 p.m. $10 adults; $8 seniors and students with ID; free for members and children under 5. Individual admission is free on Tuesdays. 203/869-0376; www.brucemuseum.org. PATRICK BIDAUX EXHIBIT. Isabella Garrucho Fine Arts, 40 W. Putnam Ave., Greenwich. Thru May 8. 203/921-9039. MASTERPIECES FROM THE MUSEUM OF CARTOON ART. Bruce Museum, 1 Museum Dr., Greenwich. Thru Apr. 20. Exhibition will showcase more than 100 original works celebrating the history of this unique art form in America including comic strips, newspaper panels, comic books, editorial cartoons, magazine cartoons, caricature, illustration and animation. Museum hours: Tues.-Sat., 10 a.m.-5 p.m. $10 adults; $8 seniors and students with ID; free for members and children under 5. Individual admission is free on Tuesdays. 203/869-0376; www.brucemuseum.org. MODERN FAMILIES: A PHOTOGRAPHY EXHIBITION. ArtsWestchester, 31 Mamaroneck Ave., White Plains. Thru May 25. Exhibition focuses the camera lens on the families we’re given and the families we choose. Rarely-exhibited group portraits by Harlem Renaissance photographer James Van Der Zee will be presented alongside contemporary photography that illuminates the diverse definitions of family in our community. Photographers include Gillian Laub, formerly of Rye Brook. Gallery hours: Tues.-Fri., 12-5 p.m., Sat. 12-6 p.m. www.artswestchestchester.org. LANDESCAPE: NEW VISIONS OF THE LANDSCAPE FROM THE EARLY 20TH AND 21ST CENTURIES. Katonah Museum of Art, 134 Jay St., Katonah. Thru June 16. The show juxtaposes the work of early 20th century American modernist painters who exhibited their works at the groundbreaking 1913 Armory Show with contemporary artists from the 21st century who have rediscovered and reinvigorated the genre. Hours: Tues-Sat., 10 a.m.-5 p.m., Sun., 12- p.m. $10 adults; $5 seniors and students; members and children under age 12 are free. www.katonahmuseum.org. STRANGE LEGACY. Kenise Barnes Fine Arts Gallery, 1947 Palmer Ave., Larchmont. Thru Apr. 20. Solo exhibition features new paintings by Canadian artist Janna Watson. Hours: Tues.-Sat., 10-5:30 p.m. or by appointment. www.kbfa.com. WAVELENGTH. Kenise Barnes Fine Arts Gallery, 1947 Palmer Ave., Larchmont. Thru Apr. 20. The solo exhibition features new work by Brooklyn artist Margaret Neill. Hours: Tues.-Sat., 10-5:30 p.m. or by appointment. www.kbfa.com. NINA CHANEL ABNEY: ROYAL FLUSH. Neuberger Museum of Art, Purchase College, 735 Anderson Hill Rd., Purchase. Thru June 30. Abney is one of the most important young artists on the rise today. She tackles controversy—homophobia, race, politics, consumerism and inequity. Her bold, flat colorful paintings and collages are packed with symbols, numbers, words, emojis, figures and body parts—all informed by celebrity culture, video games, social media, hip-hop, tabloid news and the 24-hour news cycle. Hours: Wed.-Sun., 12-5 p.m. $5; $3 seniors 62 & over and students; free for children under 12 & members; free for all the first Saturday each month. 914/251-6100; www.neuberger.org. A SPECIAL ROLE: ST. PAUL’S CHURCH AND WORLD WAR II. St. Paul’s Church National Historic Site, 897 S. Columbus Ave., Mt. Vernon. Free. Thru Jan. 2021. Mon.-Fri., 9 a.m.-5 p.m. The exhibit uses original artifacts, documents, images, sound recordings and photographs to explore the story of World War II, in the context of the history of the church and the local community. At the time, the historic significance of St. Paul’s as an originating point of America’s most prized national values, enshrined in the Bill of Rights, gave the church a special role in the broader struggles of the war. 914/667-4116. HISTORY IS…SEVEN WAYS WE CONNECT TO HISTORY. Greenwich Historical Society, 47 Strickland Rd., Cos Cob. Thru Sept. 7. Exhibit encourages visitors to reflect on the role history plays at different stages in their lives and explores the ways individuals look at, define and interpret history. Hours: Wed.-Sun., 12-4 p.m. $10 adults; $8 seniors & students; free for members, children under 18 and for all on the first Wednesday each month. www.hstg.org; 203/869-6899. WAXING POETIC. Pelham Art Center, 155 Firth Ave., Pelham. Thru Spring 2019. To Wax Poetic is to grow more expansive or expressive lyrically. Growth and transformation are inherent in the verb to wax, and within the creative or poetic process itself. Each of the six New York based artists in this exhibition has created a symbolic language, or aesthetic, using encaustic paint. Encaustic is the ancient medium of beeswax, resin and pigment, applied while molten. The medium is highly adaptable, and each artist has works selected to show the possibilities of the medium and the breadth of their vision. The new public artwork by Sui Park in the courtyard consists of five exciting creations that hang, lay and stand in different areas in the courtyard and around the art center. The materials are non-durable, disposable, trivial and easily consumed. Hours: Mon., Wed. & Thurs., 10 a.m.-6 p.m. www.pelhamartcenter.org. BRETT SLAVIN EXHIBITION AND SALE. Slavin Studios, The Mariner, 21 Willett Ave., Port Chester. Ongoing. Ceramic sculpture and functional wares. 914/671-4252. www.slavinstudios.com. COASTAL SCENE. Bruce Museum, 1 Museum Dr., Greenwich. Permanent. The Bruce Museum has acquired and installed this painting by Alfred Thomas Bricher, a well-known 19th century American landscape artist. The painting, which currently hangs behind the information desk in the front lobby of the Museum, is a fine example of luminist painting. www.brucemuseum.org. CHINESE FOLKTALE: KAI AND THE DRAGON. Rye Town Park Administration Building, 95 Dearborn Ave., Rye. Permanent installation. Clay Art Center invites individuals and families of all ages to celebrate this mural installed on the wall surrounding the historic buildings in Rye Town Park. This mural project was created and installed during the summer of 2009 by local ceramic artist Sarah Coble who created the clay tiles with elements sculpted in relief so that the mural seems to move and flow like the waterfront it faces. The tiles narrate a folktale about a young boy named Kai who fights against adversity to save his town and outwit a fearsome dragon. The vibrant tiles also reference the historic Dragon Coaster of Playland amusement park and the inspiring waters of Long Island Sound. It was created to celebrate the 100th anniversary of Rye Town Park. It was made possible by ArtsWestchester’s Municipal Challenge Grant, funded by Verizon and in partnership with the Rye Town Park Commission and the Clay Art Center. www.clayartcenter.org or 914/937-2047. HOPE MURAL. Café Brazil Courtyard, North Main Street between Westchester Avenue and Adee Street, Port Chester. Sponsored by Hope House and the Westchester Arts Council. SCULPTURE FOR PERMANENT EXHIBIT. Bruce Museum, 1 Museum Dr., Greenwich. The Museum has acquired a major sculpture by the French/American artist Gaston Lachaise titled “Man Walking (Portrait of Lincoln Kirstein).” Lachaise was one of the pioneers of modern art in the early decades of the 20th century. The sculpture depicts author, impresario and patron of the arts, Lincoln Kirstein, who with George Balanchine established the School of American Ballet which later became the NYC Ballet. “Man Walking” is the finest piece of 20th century sculpture in the Bruce collection and is currently on view in the entrance rotunda of the Museum. Admission is $7 for adults; $6 for seniors and students and free for children under 5 and members. Free admission to all on Tuesdays. Hours: Tues.-Sat., 10 a.m.-5 p.m. Sun., 1-5 p.m. 203/869-0376 or www.brucemuseum.org. CHANGES IN OUR LAND. Bruce Museum, 1 Museum Dr., Greenwich. Permanent exhibit. Exhibition addresses environmental history from global to local perspectives and from ancient times to the present. This visual display of the environmental and historical development of the area includes a mineral gallery, wigwam, life-size woodland habitat and a live-animal marine tank. Hours: Tues.-Sat., 10 a.m.-5 p.m., Sun., 1-5 p.m. Admission: $7 for adults; $6 for seniors and students and free for children under 5 and members. Free admission to all on Tuesdays. www.brucemuseumorg; 203/869-0376.